The 12V max Lithium-Ion Driver-Drill Kit (FD01W) is the perfect addition to any tool box or tool belt. The FD01W weighs only 2.0 lbs. (with battery), and delivers pro power and pro speed in an ultra-compact size for a range of drilling and driving applications. 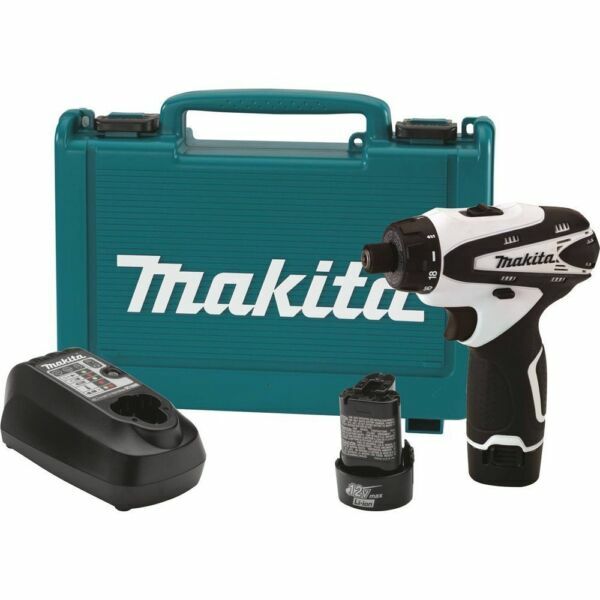 This powerful and compact cordless driver-drill is built for maintenance professionals, repairmen, remodelers, electricians, cabinet installers, and any general contractor seeking an ultra-compact cordless driver-drill with pro power and pro speed. It's part of Makita's expanding 12V max Lithium-Ion cordless line-up, which includes driver-drills as well as an impact driver, impact wrench, circular saw, recipro saw, jig saw, vacuum, and flashlights. Consistent with the rest of Makita's groundbreaking Lithium-Ion battery technology, the 12V max Lithium-Ion battery delivers more power in a compact size for maximum efficiency. The FD01W features a Makita-built variable speed motor that delivers 200 in. lbs. of Max Torque and 0-350/0-1,300 RPM, with 18 clutch settings for added precision and control. It has an L.E.D. light to illuminate the drilling surface, and an ergonomic grip that fits like a glove for even pressure and even control. Hex Shank : 1/4 in. Capacity (steel) : 3/8 in. Capacity (wood) : 13/16 in. Overall Length : 6-3/16 in. Net Weight (with battery) : 2 lbs. Shipping Weight : 8 lbs. Includes Makita warranty. For complete warranty details visit the manufacturer website at makitatools.com.